This column first appeared on June 11, 2012. America owes an unpayable debt to painter Mary Cassatt (1844-1926). She was the only American to become a significant part of the inner group of French Impressionism. She was also the unrelenting campaigner who persuaded Americans to collect the Impressionists. Mary Cassatt was a fine painter, and though she lived much of her life in France, she belongs to us. A collection of either Impressionist art or art by American painters would be incomplete without her works. 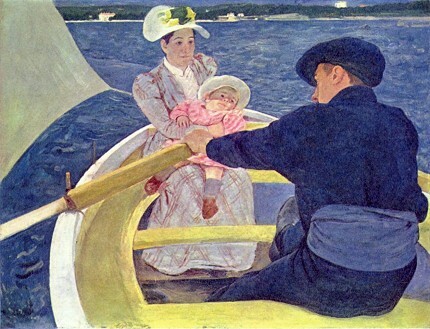 "The Boating Party," by Mary Cassatt, was depicted in a United States postage stamp. Measuring 35 1/2 x 48", it was painted 1895-94. It hangs in the National Gallery of Art, Washington, D.C.
Half a century ago the French complained that all the good Impressionist paintings which were coming on the market were being bought by rich Americans. We could only retort that, after all, the French had first choice in the early days and generally blew it. Because of Cassatt, Americans weren't johnny-come-latelies. Cassatt was not one of the first Impressionists, but she came to the movement soon enough to become a wonderful part of it. Compared to the poverty of the other painters, she drank from a silver cup. She was born near Pittsburgh, where her father was a land speculator and stockbroker. Her mother, well educated and well read, came from a banking family. Mary was one of seven children, two of whom died in infancy. Her brother became head of the Pennsylvania Railroad. Well-rounded education required travel, and young Mary spent five early years in Europe learning German and French and taking lessons in drawing and music. She may have seen art by Ingres, Delacroix, Corot, Courbet, Degas, and Pissarro at the 1855 Paris World's Fair; the latter two, who would become her important friends, were not yet Impressionists. Her parents were shocked and displeased when she informed them she was going to become an artist. Fatigued of making academic drawings of plaster casts at the Pennsylvania Academy, she announced she was going back to Europe to become a real artist. The year was 1868 and she was twenty-three. Her father reportedly complained, "I would almost rather see you dead." She began by studying Old Masters in Spain and Italy. She moved to Paris in 1874, just when the first rays of Impressionism were poised to fracture Academism. A dealer on Boulevard Hausmann put a Degas pastel in his window. As Cassatt later said, she flattened her nose against the vitrine. She knew who would be her great masters. Cassatt did not meet the misanthropic, egocentric Degas until three years later. Despite frictions, they became close friends; in fact she probably was Degas's closest buddy. At the same time, she was an exceptionally gifted painter in her own right. An early, pre-Impressionist painting was accepted for show by the Selection Jury of the 1868 Paris Salon. Later works found their ways into important museums. Her "The Boating Party," which hangs in the National Gallery of Washington, D.C., has been featured on a postage stamp. Cassatt became a resonant part of this new Impressionist wave. Because she did not need to sell her paintings to live, she turned all her irrepressible energy, charm, and influence towards selling the canvases of her friends - Monet, Pissarro, Renoir, Cézanne, Sisley, and Degas - to her wealthy American friends. She bought their paintings herself, financed the dealer Durant-Ruel when he brought a collection of the Impressionists to New York City for show and sale, held teas in her apartment to introduce artists to wealthy friends. Sugar King H. O. Havemeyer assembled a significant collection because Cassatt impelled him. So did Chicago's redoubtable Mrs. Potter Palmer, which is why the Chicago Art Institute owns some of the greatest Impressionist canvases ever painted. And the interest she started eventually led to other breathtaking American accumulations such as the Barnes collection in Pennsylvania, which includes hundreds of Impressionist paintings purchased by the roomful. "But madame, you are completely ignoring a painter that Degas considers very great." "Who, then? "Cassatt asked in astonishment. "Ah, bah!" Cassatt replied in genuine modesty. The customer turned away muttering, "That must be a woman painter, and is she jealous!"